More about this property: This superb 6 bedroom holiday barn sits in an impressive countryside location with the stunning Ribblehead Viaduct as a backdrop, beautifully decorated to retain charm and character, this spacious holiday home is ideal for groups of up to 13 friends or family looking to discover some of the best of the Yorkshire Dales National Park together. Relax in the warm bubbly hot tub after exploring the area and enjoy fun times with friends or family in the games room with a game of pool. More about this property: Traditionally decorated, Bridleways Cottage sleeps 4 and offers a glimpse into country life in the Yorkshire Dales. You and your family can spend time exploring Ingleton and its waterfalls, which are only 2 miles away, or explore the civil parish of Bentham, which is a mere 5 miles from the property. Spend your days exploring all the Yorkshire Dales has to offer, be it on foot, bike or horse. More about this property: Beautifully presented 1 bedroom stone-built holiday cottage situated in the heart of Haworth in Bronte Country, this couple's cottage is a great base for exploring this romantic part of Yorkshire. More about this property: Stylish sleeps 4 log cabin with hot tub and sauna, ideal for a relaxing holiday close to the Yorkshire Dales National Park. More about this property: Light, airy and surrounded by sumptuous views of Yorkshire countryside, sleeps 4 Cowslip Barn is the ideal base for a family holiday full of walking, eating and discovering all the best features of northern life, including the beautiful Yorkshire Dales. Sleeping 4, this barn conversion is perfect for a small family or group of friends, and is less than 20 miles from the city of Lancaster - famed for its castle and various museums. More about this property: Escape to this beautiful characterful holiday cottage in the Yorkshire Dales National Park, sleeping up to 10 and with a dogs welcome policy, this 4 bedroom holiday home offers superb countryside views as well as a charming village location in the Coverdale area and sits within the Yorkshire Dales National Park. More about this property: 3 bedroom converted barn located in the heart of the Yorkshire countryside, just a stoneâ€™s throw away from the Yorkshire Dales and home to exposed beams, under floor heating and a wood burner that will keep you all cosy on chilling evenings. More about this property: Modern and stylishly presented 2 bedroom stone-built farm cottage, situated just 3 miles from Settle and just outside of the Forest of Bowland AONB and the beautiful Yorkshire Dales National Park. More about this property: Make some family memories in this 5 bedroomed, stone built beauty - pets are welcome in this open plan wonder, as is the opportunity to relax entirely. Steeped in lush green countryside, realise all that Lancashire has to offer by day, and cuddle up in your king sized bed in the evening. More about this property: On the edge of the Yorkshire Dales lies the most gorgeous property that sleeps 7, and is sure to delight all; Gilchrist Riverside Cottage is carefully and beautifully decorated, welcomes pets and has a game's room - so none of the family need to be left behind! Located in the lovely town of Settle, this renovated cottage is close to many self catering perks, such as a train station and many places to eat and drink. For a nice day out, travel the fourty miles to visit the spa town of Harrogate, a charming town that will provide the most wonderful day trip. More about this property: Searching for a sleeps 2 North Yorkshire cottage with an air of charm and romance? This lovely romantic retreat with its exposed stonework and wooden beams is a great couple's cottage set in the little village of Middleham close to the Yorkshire Dales. Self-catering holiday accommodation in and around the Yorkshire Dales National Park in the north of England. 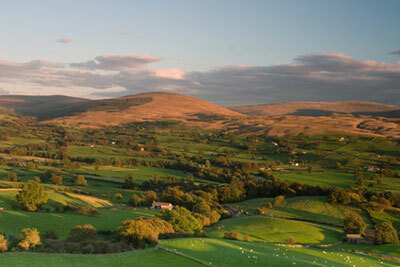 Have the holiday to remember in the stunning Yorkshire Dales. Enjoy the warm welcome of the Dales, true Yorkshire hospitality and discover a part of England that time forgot. Stone built-cottages and limestone dry walls that traverse the hillsides, moorland teeming with wildlife. Watch colourful pheasants cross the road and escapee sheep graze the grass verges. Discover strange rock formations, stalactites and stalagmites in deep caves, tumbling rivers and waterfalls. Book a holiday cottage, house or log cabin for a relaxing holiday with nature - your own holiday home for a week or short break. Click on the cottage photographs to begin deciding which part of the Yorkshire Dales you would like to visit next.